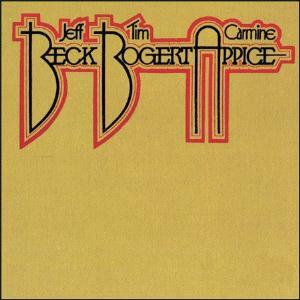 If this was a review for a blues-rock site, then Beck, Bogert, Appice would certainly warrant 3 stars. In this case, there is nothing new under the sun to be found here for proggers. Not only is the music not really progressive, it's actually regressive, as this trio seems to be attempting a replication of the ultimate power trio, Cream (sorry to all Rush fans!). Inexplicably, these guys are all top- notch musicians, but they choose here to focus the album on tight songs that emphasize the vocals. When a group like this gets together, I want to hear them cut loose and PLAY! We don't get that here, and whether it made them money or not, it's a bit of a waste of talent. The highlights: Black Cat Moan, Lady, Superstition, Why Should I Care?, Lose Myself With You, Livin' Alone. Six songs out of nine as highlights? This has to be a solid album, right? Well, there's a gigantic caveat: the vocal parts are mostly forgettable (and don't even expect anything regarding lyrics), and you find yourself looking forward to the instrumentals (read: guitar solos). But these are highlights for a reason: Beck really grinds his guitar on the opener, and all three of the boys really cook for Lady. I also appreciate the cover, Superstition, and if Stevie had sung this version, I would prefer it! The lowlights: Oh to Love You, Sweet Sweet Surrender, I'm So Proud. The titles should alert you to their quality, as they are slower feature the vocals, and individual virtuosity is almost nonexistent. Any producer should have known that these are the kinds of tunes that this group would not excel with. Overall, retreaded blues and rock standards, with a few incredible licks from Beck, fat bass from Bogert, and inspired drums by Appice. Unfortunately, they are too few and far between. I'm personally very pleased that Beck decided to go in the fusion direction with later works in the 70s.